1. Wash hands to remove any dirt or oil. 3. Peel decal away from package background. 4. 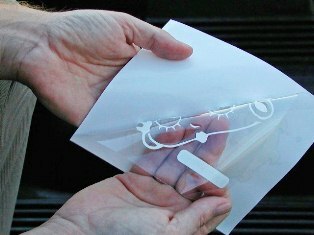 Lightly place decal on mounting surface. 5. 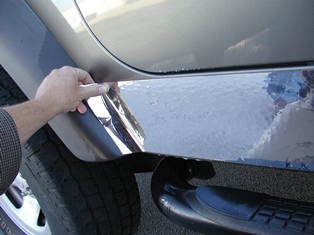 Starting from the center out, rub firmly to secure the decal bond. 3. Remove decal from packaging. 4. Separate backing from decal making sure to leave the decal attached to the top transfer tape. 5. 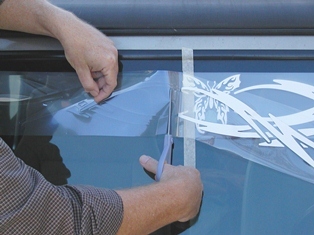 Lightly place decal on surface. 6. 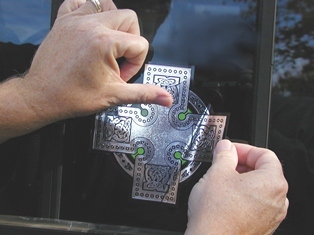 Starting from the center out, rub firmly with fingers to secure the decal bond. 7. Remove the top transfer tape leaving only the decal. 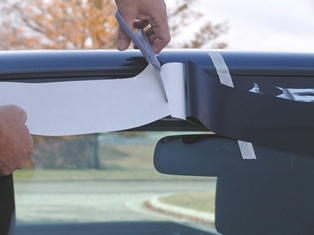 Tools Required: masking tape, scissors, hobby knife, hair dryer, credit card or squeegee. 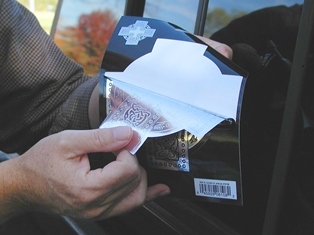 * This product has two layers: paper back liner, vinyl decal. * It may require two people for proper installation of this product. 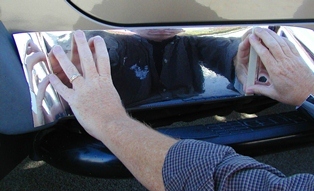 * A heat source such as a hair dyer may be used to make the vinyl pliable for fitting convex surfaces (do not overheat). 1. Wash hands to remove any oil or dirt. 3. Position the entire product on mounting surface. 4. 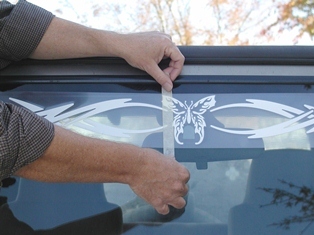 Run a strip of masking tape down the center of the decal onto the mounting surface, both top and bottom. This will create left and right mounting halves which will hold the entire product (both layers) in place while mounting. 5. Lift the left half up, stopping at the center, next to the masking tape. 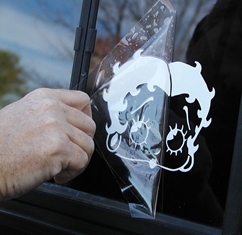 Peel the Paper Back Liner away from the Vinyl Decal. 6. Cut away the left half Back Liner with scissors. 7. Starting from the center, use a Credit Card with a sweeping motion up and down to mount the left side of the decal. 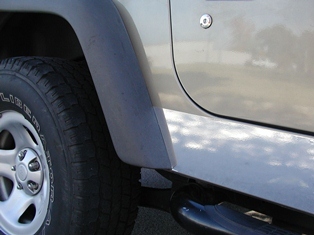 Use tension to follow the contour of the windshield. 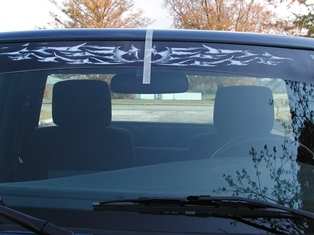 (A heat source may be used to make the stretching Sunscreenz follow contour of windshield). 8. Remove the masking tape. 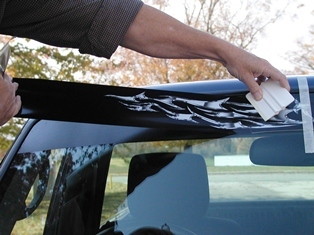 Remove the Back Liner from the right side of the decal and repeat mounting procedures for the left side. 9. 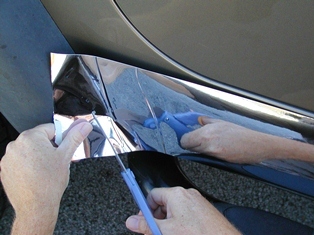 Carefully trim away excess material with a Hobby Knife (do not cut the rubber sealer for the windshield). Tools Required: scissors, spray bottle, liquid soap, clean cloth, hobby knife, credit card or squeegee. 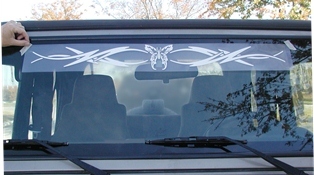 * This product has two layers: paper back liner, vinyl decal stripe. 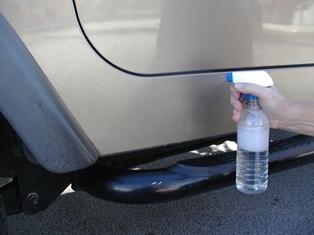 * Mix 1 part liquid soap to 10 parts water and pour into a spray bottle. 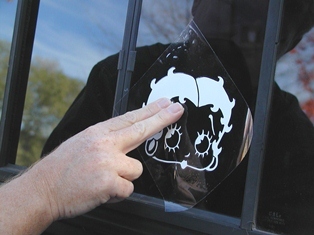 The solution will help position the decal. 3. Position the entire product on mounting surface, and measure it to fit mounting area with a slight over hang for trimming. 4. Trim the product with scissors to the overall length desired. 5. Soak mounting area and back of tape with soapy solution. 6. 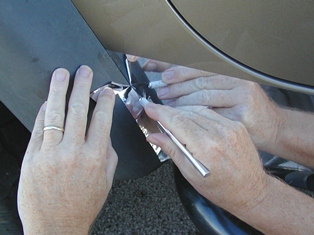 Mount the tape into position (make sure to keep it wet, it will slide into position easier). 7. 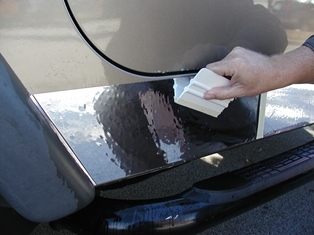 Starting from the center out, use a squeegee to remove excessive water and soap. 8. 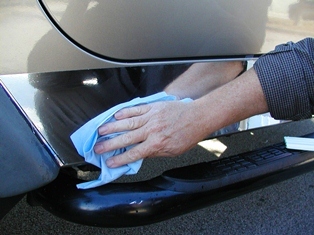 Wipe clean with a smooth dry cloth. 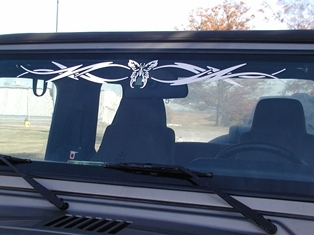 Note: This product has three layers: clear back liner, vinyl decal, clear top carrier. 4. 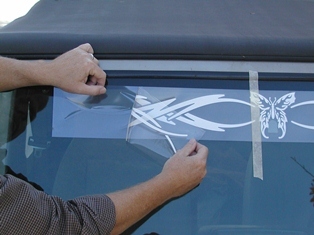 Run a strip of masking tape down the center of the decal past the carrier onto the mounting surface, both top and bottom. This will create left and right mounting halves which will hold the entire product (three separate layers) in place while mounting. 5. Lift the left half up, stopping at the center next to the masking tape. 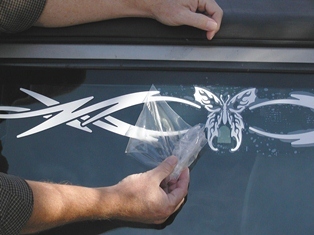 Peel the Clear Back Liner away from the Vinyl Decal and Clear Top Carrier. 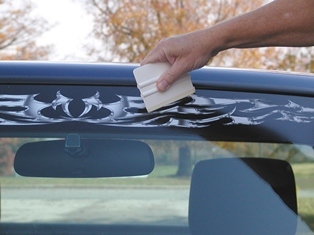 Make sure the Vinyl Decal and Clear Top Carrier stay together. 7. 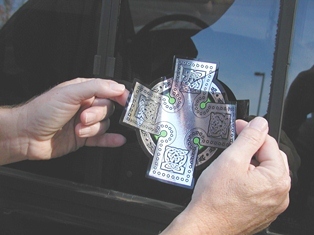 Starting from the center, use a Credit Card with a sweeping motion up and down to mount the left side of the decal with the carrier still bonded. 8. 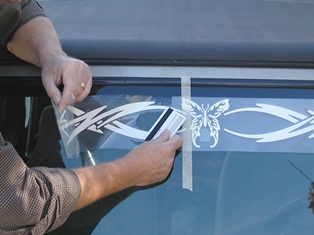 Remove the masking tape and repeat steps 5-7 for the right side of the decal. 9. 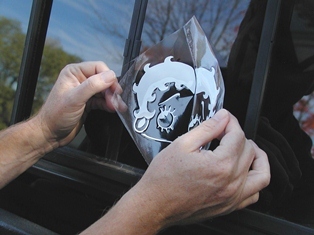 Carefully remove the Clear Top Carrier leaving the attached decal to the mounting surface.